Mexico is not just haciendas. My love affair with Guadalajara continues. As mentioned in the previous post, if big cities rev your engine, Guadalajara should be your choice if you are considering moving part or full-time to Mexico. Unlike Mexico City, Guadalajara still has Mexico prices. It's got the rest too - near-perfect climate and endless things to do in the city and outside it. Seven Pueblos Magicos share its home state of Jalisco (one is the birthplace of Tequila). The concerts, art scene and sheer magnitude of neighborhoods to explore will provide you all the things you love about big cities; the energy, the food, the parks and so much to do! No wonder Mexicans get bored in many American cities. Even Denver's downtown districts on a Friday night seems empty compared to the throngs on Avenida Chapultepec, a boulevard of bars, restaurants and stores with street stalls staging in the middle of the avenue. You can watch street performers, look through used books, jewelry and other handmade wares in this swath of land between lanes, and bop back over to the nightlife. Popular neighborhoods in Guadalajara often look like the Super Bowl just got out. People pouring out into the streets by the thousands to enjoy their good fortune of spring-like weather year-round (one reason I always feel safe in Guadalajara's entertainment zones is that an attacker would need to do it in front of at least 50 witnesses). With four million people in the metropolitan area and eight million total, in trying to get your arms around the city you first might feel like the proverbial blind person trying to describe an elephant by feeling its truck. It helps to focus on landmarks. This Discover Guadalajara guide gives excellent information on where to stay which can double as a list of areas in which to live if you are considering retiring there. Unlike other areas that attract ex-pats, Guadalajara has so many safe, leafy and cool neighborhoods that expats are dispersed throughout the city in one of eight or nine more affluent areas like Providencia, Chapalita, Zapolan, and Chapultepec rather than almost exclusively expat communities like those that exist in Lake Chapala and Ajijic. What has made the neighborhood of Zapopan interesting to me is both its level of modernity and home-owners’ deliberate fortress-like facades. American homes usually have high levels of security, but they are discreet in displaying it, sometimes with little more than a small blue ADP sign stuck in a shrub. Expensive homes in Mexico send a loud signal. You almost never see windows facing the street on the ground floor. Expansive garage doors, always facing the street, are an integral part of the curb appeal, sometimes sporting expensive wood inlays and accent lighting. There are no front lawns as we know them. Usually, the outer walls are topped by a two-strand fence of wire of some sort. A patio area is often placed between the garage door wall entrance and the wall and door to the actual house. Decorative traveling vines running over outside walls facing the street usually have long, sharp thorns, practically like barbed wire. These houses have found ways to may security features attractive, but not hidden. Even many more modest apartment complexes in Guadalajara have gated entrances, with a security guard stationed in an office at the gate and private security roaming the area. These features would be easy to misinterpret. All this is not to say that crime is a problem here. I would feel completely safe walking in my current neighborhood anytime during the day or night. Cameras are spread throughout the area and security personnel, vigilantes (private security personnel) drive through the neighborhoods in their cars 24 hours a day. While burglary no doubt would be a problem without these precautions, one thing to remember about Mexico is that it throws people rather than technology at a situation. Homeowners in the U.S. put their money into expensive electronic security systems and technology. Mexicans still like to hire people. As a friend once put it, you will never see only one bartender behind the bar at an event in Mexico. Same goes for security people, retail clerks, baristas at the coffee kiosks and construction workers. They throw twice as many people at the situation. Labor is still cheap in Mexico. A security person in the U.S. makes between $15-20 and hour, or $2,720 a month based on the median salary of $17 @hour. A vigilante de seguridad in Mexico earns around $5,900 pesos a month, or about $350 dollars U.S. This is how neighborhoods double up on security. These fraccionamientos (planned communities made up of roughly the same style homes) and colonias (suburbs) are just as quiet as any parallel neighborhood in the United States, maybe even more so because walled back patios and internal gardens take the place of front lawns. Mexicans are more proactive in their security measures. Ever since arriving in Mexico four years ago, I have noticed that home locks are in often themselves works of art, unlike anything I’ve ever seen at home. You will see all kinds of bolts, buttons and special keys on houses in Mexico (Professional lock pickers, I’ve come to learn from research, are akin to the computer hacking community - they love when a company brags about having an unbreakable lock). You see all kind of novel deterrents. If you rent a house in Mexico through Home Away or Air B&B, it’s worth noting that you need to take more time to understand your host or homeowner's locking systems, as they can be quite elaborate. Often you will need to unlock doors to two barriers before entering the actual house and windows usually have special features too. Always hand-test that the door's locked behind you. Don’t count on them being locked by just looking at them. Next up: Decide between Lake Chapala and Guadalajara by staying in this fabulous city between the two. Most recent: If you're thinking about Mexico and love big cities, Guadalajara is your only (affordable) choice. I prefer to study from my beautiful Acer Aspire laptop. It's thin, lightweight and perfect for travel - well worth the investment. 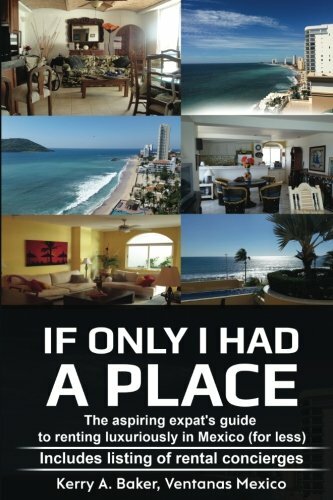 "If Only I Had a Place," a guide to renting in Mexico with style, which includes a listing of rental concierges in Mexico's most popular expat areas. Check out the reviews!